Hey, all y’all! I hope you’re not broiling in the heat. I’ve been very lucky; the weather in Sacramento has been somewhat mild, except for about two days when it topped 100°. But that’s not why I’m writing. I wanted to do a Show & Tell about my new straps. 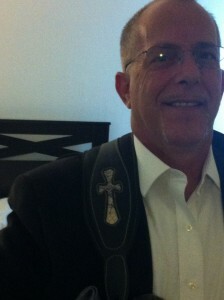 For several years I have endorsed LM Products, a wonderful Indiana company that makes straps. They do everything from the basic nylon jobbies to full-on custom leather straps. I love them because they do extremely high quality work, and for a very reasonable price. 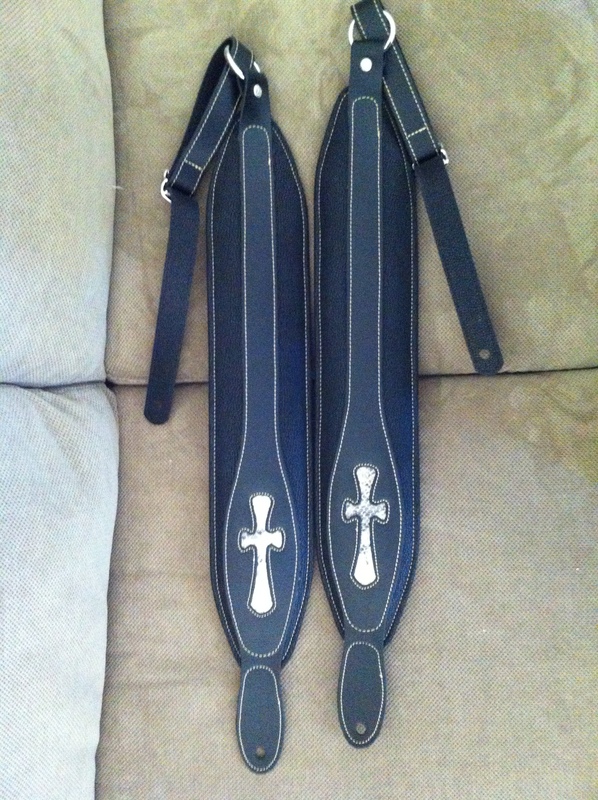 Yesterday I received two new straps I ordered – both with a Celtic cross design. This is a custom piece that combines two of their designs. In addition, the folks at LMP are kind enough to punch a slightly different hole at each end – it’s a bit larger than normal to fit my straplocks. And they also provide me with a shorter-than-normal tail piece, which is essential due to my short stature and the location of the tail pin on Spector NS basses. I ordered a pair of the straps so that I’d have one for my back-up bass as well. I was like a kid at Christmas when they arrived yesterday. I was actually on my way out to do a few errands when I noticed the box at my front door. Obviously, I had to open the box and check out my goodies before leaving. In fact, I almost forgot about my errands! As always, the straps are beautifully finished, and they look great! The pictures here don’t do them justice, as they were taken with a cell phone camera. But at least you can get some idea of how they look. Huge thanks to everyone at LM Products, especially Karen and Pat, who do all the leather work, and LJ Mechem, the president of the company, and the one who was kind enough to accept my endorsement. As always, I endorse the company because they make outstanding products and back them with exceptional customer service. I can’t recommend them highly enough. If you want a strap that looks and feels great, please do check out my friends at LM Products. As for the rest of my life… everything continues to go very well, I’m happy to say. The workload is still huge, but we’re getting through it all one step at a time. In addition to preparing the music for the upcoming recording sessions, we’re working on all the other stuff that goes into a successful record – promotional stuff, photo shoots, video shoots and more. I’m having the time of my life, even though I’m a bit overwhelmed by it all. Every day brings something new, and offers a new challenge. I’m very lucky to have a great team that handles so much of the load! One Response to New Straps! Beautiful. I posted this on the Row!